It was wonderful to see so many of you at Back to School Night. The faculty and I thoroughly enjoyed the opportunity to meet with you, share information about the curriculum, classroom practices and answer your questions. For new and returning families, there is so much to learn about the Cabot School and community! 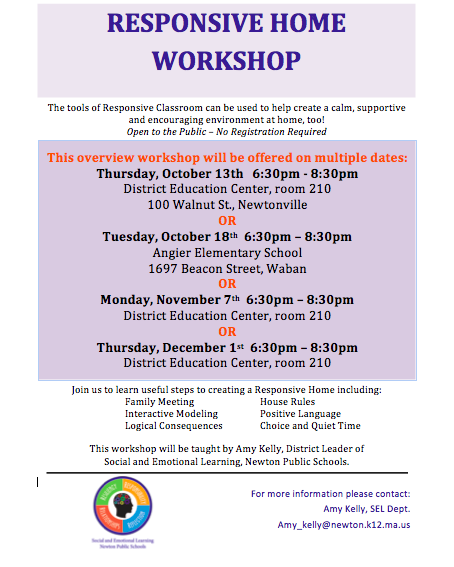 Below are descriptions of two upcoming events that provide additional opportunities to learn more about school programs: Responsive Home and CAPP. Finally, there is a brief description about possibly changing the start time for high school. Those plans have implications for the starting and ending times for middle and elementary schools, so be sure to keep abreast of these scenarios. The tools of Responsive Classroom can be used to help create a calm, supportive and encouraging environment at home, too! Each year Child Assault Prevention (CAP) Specialists come to the elementary schools to teach children vital skills to help them stay SAFE, STRONG and FREE. CAP will be conducting kindergarten, second and fifth grades workshops at Cabot School in November. So that you can learn more about this program, we invite you to attend the Child Assault Prevention Program parent meeting on Wed. Oct. 26, 2016 at Cabot School from 7-8 p.m. Read more. Recently, you received an email from the superintendent detailing Newton’s work on high school start times. This fall, the district is asking for your thoughts on the benefits and costs of moving the high school start time later, as well as feedback on several potentialscenarios. Some scenarios change only the high school hours, while others impact our school and others in the district.